The pH meter has become a critical piece of equipment for all grain beer brewers as well as for cider, wine and mead making. 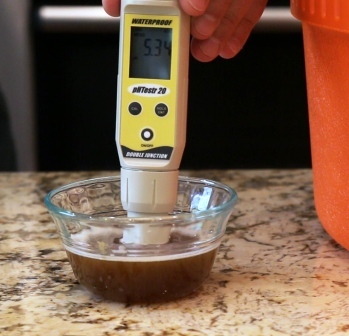 This week I take a look at selecting, calibrating, and using a pH meter to brew beer. In the last 10 years or so, our understanding of the important role mash pH plays in brewing beer has driven commercial and home brewers to increasingly work to monitor and adjust their mash pH. I’ve previously covered the importance of mash pH, as well as incorporated tools for estimating and adjusting mash pH into BeerSmith. Unfortunately mash pH predictions only go so far, so most serious all grain brewers choose to purchase a pH meter to monitor their pH during the mash and sparge and make real-time adjustments if needed. In addition, pH meters can be used in cider, wine and mead making. For example if the pH of mead or wine drops too low during active fermentation it can inhibit fermentation and result in off flavors. So I use my meter to monitor pH levels daily during active fermentation for my meads and wines. Accuracy – The best meters will be accurate to +/- 0.01 pH accuracy. Units with only +/- 0.1 accuracy are not as desirable for brewing as even a 0.1 point change can be significant when measuring mash pH. Automatic Temperature Compensation (ATC) – This system measures the temperature of the sample and applies a correction factor to it to adjust the pH measurement for temperature. While useful, it is not always accurate as the solution itself may chemically change pH with temperature (not matching the ATC adjustment). If possible, it is best to draw a mash pH sample, cool it first, and then measure the pH. Calibration – All pH meters need to be calibrated using known solutions. Generally two systems are used. A manual calibration forces you to adjust some knobs for high/low calibration values, while the automatic calibration system simply asks you to put the meter in various pH solutions and adjusts an internal table to digitally calibrate your meter. The digital system is certainly easier to use. Probe Connection – As I mentioned above, the probes should be replaced every 2-3 years. Higher priced pH meters have removable probes (usually a BNC connection) so you can purchase and install new probes without having to replace the entire meter. All pH meters require calibration using known pH solutions – usually three solutions at pH 4, 7 and 10. In addition, your probes should be stored in a pH storage solution to preserve their lifespan. So to even use your pH meter you need to purchase a pH buffer/calibration kit which has the three solutions with pH 4,7, and 10 and I recommend also getting the pH meter storage solution as well. For example I’ve been using this calibration/storage kit from Amazon (affiliate link) for my pH meter. For an automatic (digital) pH meter, you generally push a button to calibrate the meter and will be prompted to put the meter into the pH 4, 7, and 10 solutions. A manual meter may require some additional steps – read your pH meter manual to determine how to calibrate it. I generally calibrate my meter every time before brewing as it only takes a few minutes. For storage, I immerse my probes in a small amount of storage solution. This can help extend the lifespan of the probes and also helps maintain calibration if I am doing something like measuring the daily fermentation pH of a mead. Using a pH meter is a simple affair. I generally draw a small sample of the wort or beverage I’m measuring and then dip the probes into it to get a pH reading. As I mentioned previously there is one issue to consider when measuring hot wort in the mash, which is temperature. While the ATC system on many modern probes will measure the pH at temperature, this number may still not be 100% accurate because the solution itself will chemically change when cooled. By convention pH should be measured near room temperature (i.e. under standard conditions). So from an accuracy perspective, the best thing to do is to draw a small sample of mash and quickly cool and de-aerate it with some rapid stirring before measuring the pH as shown in the picture above. I hope you enjoyed this week’s article on pH meters. Thanks for joining me on the BeerSmith Home Brewing Blog. Be sure to sign up for my newsletter or my podcast (also on itunes…and youtube…and streaming radio station) for more great tips on homebrewing. Also check out the How to Brew Video series I shot with John Palmer if you want to learn more about all grain brewing. I think by now everyone knows the importance of mash pH. The lack of information is on which meter gives the average homebrewer their bang for their buck. You’re lucky if you can find a recent market comparison on pH meters for soil analysis, let alone home brewing. Do you have information on that? As a former organic chemist turned homebrewer, I’d like to validate the info here by showing you what a chemist does with top-of-the-line pH meters. When something came into the lab to be tested, we cooled the sample to 20 degrees Celsius (72 degrees Fahrenheit). Always. Then and only then did we take the pH. I suppose you can get an ATC probe, but I’m happy doing it the way the pros do: cooling your sample. After use, the probe was rinsed off with distilled water, and then always stored in solution, as mentioned in the article above. Storing your probes in solution keeps them happy. We like our pH probes happy. And yes, you want to get a meter with a replaceable probe. You change the oil in your car because stuff wears out. So does equipment like a good pH probe. And yes, I agree with the recalibration every time you use your pH meter, because of the time between batches brewed at home. pH meter readings can drift, and as long as you’re putting this level of care into your brewing, do it right. Thanks for the links to the recalibration solutions! Great article.